Arrows: #1 shows a notch that helps ripping the cover open and dampens the sound; heaven forbid that anyone else in a women's restroom should think someone was using a tampon. #2 The petal-like opening of the applicator. Flowers have long been linked with menstruation, maybe even ironically, although the word itself probably came from French and meant "flow." And the camellia has had a bizarre association with menstruation in Germany. 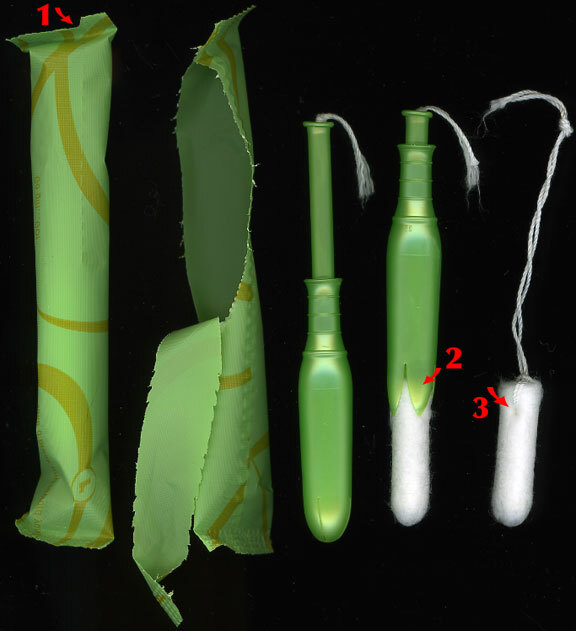 #3 The string penetrating the plug, seen also in early tampons.